TonyBet are an online company providing sports betting, gaming and live betting. Established in 2009, TonyBet operates by the UK and Estonian gaming licenses allowing them to provide services to the entire of the European market. The bookmaker have been building with each passing month up to the point that they are now becoming one of the best brands in the industry. While thy may not yet be as well-known as some other bookmakers, they are well on their way towards achieving this, with the bookie offering pretty much everything you could ask for when it comes to online betting, including football, cricket and tennis, however, they do not seem to offer horse racing, which can be a dealbreaker for many, with the market surrounding the horses a big one. TonyBet are a bookmaker that specialise in offering superbly competitive odds in sports, while they also offer the ability to bet on live gaming services such as casino and poker. While they may not be the most well-known brand in the game, they are an ever-improving, ever-growing bookmaker that offer a glut of markets from a range of different sports. What do TonyBet do and what markets do they offer? TonyBet offer a vast array of sports to choose from which provides their customers with a huge amount of options when it comes to betting. Of course, football is very well covered on the site with the first thing the customer sees a revolving wheel of games, with the odds for upcoming football usually the matches that are provided. Alongside football, TonyBet also offer a range of sports. Whether the customer wishes to bet on the more standard sports such as cricket and golf which are covered, while bettors can also make the most of markets including politics and martial arts, which gives a lot of choice when it comes to making the most of any and all available markets. However, as previously mentioned, there do not seem to be any markets on horse racing, which could be a problem for some bettors. When it comes to football, the standard markets are all covered. The Match Winner, Handicap, Total Goals and 1st Half Result are just a few of the array of available markets that they offer, with the customer having to scroll for a decent amount of time before they reach the bottom of the page and the end of the markets. 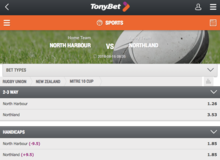 However, when it comes to a game like rugby union, there are significantly less markets to bet on, with TonyBet only offering 2-3 Way and Handicaps on some matches. Of course, this may change when bigger international matches are available, but for any fan of smaller games in the northern or southern hemisphere, this can be a frustrating feature. Do TonyBet offer good odds? At first glance, it seems as though TonyBet offer good odds. Their range of markets covering the different games and leagues often sees other bookmakers struggle to give a truly competitive range of odds across all of their sports. However, TonyBet seem to have cracked this particular code, with their odds on football as competitive as they are in the golf section. This means that their customers know they will be given competitive odds across whatever sport they chose to bet on that day, meaning they do not have to utilise another bookmaker when they are looking to bet on a different sport. Do TonyBet offer any promotions? When on TonyBet’s site, clicking the three-lined icon will bring up a sidebar with all of the available sporting options. One option near the top of the list reads ‘Odds Boost’, and gives TonyBet’s latest odds boosts for that day. This will allow the bettor to take advantage of any boost the bookmaker is giving, with a number of very good boosts available to take advantage of. TonyBet are also offering a range of promotions right now, including 100% Welcome Bonus Up To £200, Acca Weekends, No Goals No Loss, and many more. TonyBet clearly pride themselves on their range of offers, and bettors can take advantage of their competitive odds and array of promotions in tandem to enhance their experience. Why should you get an account with TonyBet? TonyBet prove with their competitive odds, fast and up to date sports book and range of promotions that they are right up there when it comes to sports betting. While they may not be as big a name as others in betting right now, if they continue on this upwards trajectory, then they will continue to make a name for themselves in the market and only improve. Most promisingly, if TonyBet do continue to improve in such a way as they move closer to the top, their odds and sports book will surely only get better, which could mean they go from a very attractive bookmaker to one that is at the forefront of the gambling industry, providing a superb user experience for all of their customers. Do TonyBet offer In-Play betting? In-Play betting has quickly become one of the biggest draws of betting, with the ability to pre-empt an upcoming wicket in cricket, foresee a sudden change in the leader in Formula 1, or predict a last minute winner in the football something that can offer very good odds. This has seen many bettors turn into people that feel they can tell the future, and the betting industry provides their customers with the perfect way of showing of their skills via In-Play betting. TonyBet do no disappoint on this front either, offering odds that remain competitive by constantly changing when a game or event is being played out. TonyBet’s ability to provide such good odds is another reason why they are such a viable option when it comes to betting.